HeatShield X-55 TFTM treatment material is a fluid applied material that incorporates heat insulation properties based on proprietary mineral and polymer technology. HeatShield X-55 dries to a firm and durable enamel finish. 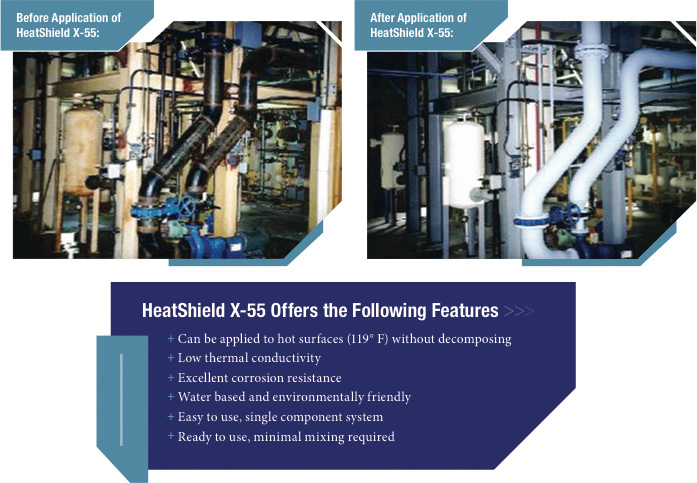 HeatShield X-55 is used on HVAC equipment, boilers, heat exchangers, industrial tanks, cold boxes, rail cars, shipping containers and most other surfaces to reduce or eliminate heat loss or gain. Recommended substrates are various metals, some plastics, masonry and concrete. The standard product is unpigmented, turning white at specified dry film thickness. HeatShield X-55 is also available in military specific, 686A, Desert Tan and custom colors on request and at additional charge. X-55 is made from our most durable acrylic resin system and is appropriate for severe service requirements. If extreme durability is required, X-55 should be top coated with INCA CH202. Remove all loose scale, dirt, grease, soap, and water-soluble paints. When necessary, prime bare or rusted metal with INCA brand RCMP or PS100 primer. Oily surfaces must be washed with detergent and water, thoroughly rinsed and dried. When stirring, use slow speed agitation with a high efficiency mixer. Do not exceed 800 RPM. Airless spray application is recommended. Remove all filters from the spray system except the foot feed strainer. When spraying, delivery should be at a minimum of 2000 PSI. Tip orifice size should be .023" to .029". Use warm, soapy water to clean equipment before residue dries. For brush and roller applications, product can be diluted to up to 5% to lower viscosity; but more coats will needed to build to the desired film depth and drying time will be extended. For spray applications you can add up to 1 quart of water to each 5 gallon pail. For maximum effectiveness, apply multiple 10-15 mil (250-375 um) (wet) coats. X-55 dries to touch in 1 hour at 75° F and 50% relative humidity. Total cure time is 24 hours. Longer drying time is required at higher humidity and lower temperature. Typically, subsequent coats can be applied in 1 hour intervals, but will vary due to individual circumstances. Because this product is water-based, exterior application shall not begin during: inclement weather; when precipitation appears imminent; when freezing conditions are imminent; or when freezing may occur within 24 hours. Depending on how it is being used, check the finish coat at least annually for surface integrity. Repair any cuts, cracks or punctures according to General Requirements of the Application Specifications. Product comes in 1 and 5 US gallon buckets and in 55 US gallon barrels. With proper storage, the shelf life of HeatShield X-55 is 6 months. Do not store in direct sunlight or near high heat sources. Air temperature of storage area shall be maintained between 40° F and 110° F. During long term storage, it is recommended that containers be rotated top to bottom every 3 months to retard complete separation of solvents and solids.